No butter. No milk. No cream. No kidding. Avocados are not just for face masks and guacamole, people. 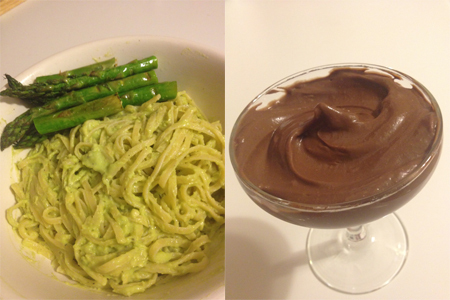 In fact, this smoothtastic and B-vitamin-filled Mexican berry (true story, look it up) was the foundation of my delicious dinner and dessert last night: creamy avocado pasta and chocolate pudding. I also had a salad, so you can stop judging my fatty ways right now, judgy. Mr. Cosby may or may not be eating my pudding in this picture. Before you get all freaked out and walk away from this blog while shaking your head, know that you can’t taste avocado in the pudding. Not at all. It tastes just like chocolate pudding should taste: glorious. Trust me, Mr. Cosby would approve. I adapted this recipe, with only slight changes, from the fabulous Angela of Oh She Glows blog fame. My most serious recommendation: stick to one or two cloves of garlic. The original recipe calls for three cloves but, while I loves me some garlic, three left me with vampire-repelling breath. What if Edward had come calling?! Cook your pasta according to the box instructions. While your pasta is cooking, blend the garlic, lemon juice and olive oil in a food processor until you get a smooth mixture (and you don’t see any garlic bits). Add the avocado, basil, and salt to the mix and blend until it’s all one creamy dream. Grind some black pepper onto your creation. **Angela notes that the avocado causes this dish to not reheat well. But because leftovers are a very important part of my very unimpressive life, I had to develop a fix: set aside some of the sauce and some of the cooked noodles in separate containers and refrigerate both. When you want to nosh on your second helping, heat up the noodles by adding a little water (not too much or your final product will be soupy) to the container and pop it in the microwave for a minute or so, and then toss the pasta with the sauce. Voila! All you need for puddin’. This miracle of a recipe comes from the awesome team at The Centered Chef in Chicago, where I took a deliciously informative (and BYOB!) Vegan 101 cooking class last week. If you live in the area, I highly recommend signing up for a session. They also offer a vegan baking class that I’m game to try whenever the funds magically appear in my bank account. More recipes from that experience are on the way. Scout’s Brownie’s honor. 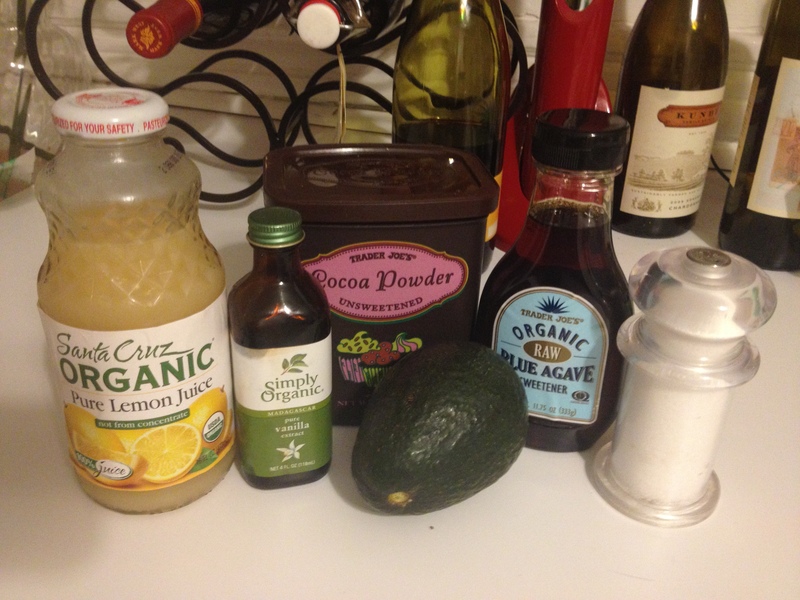 Dump your avocado bits, agave nectar, cocoa powder, vanilla extract and sea salt (yep, all of it) in a blender or food processor and blend away. Gradually add water until your pudding looks like, well, pudding. Stop the processor and make sure all of the cocoa powder is scraped off the sides and into the mix, and keep mixing until all the avocado bits are broken up. Scrape up every last bit of that chocolatey goodness, and set in the refrigerator for about an hour to chill. Do your best not to eat all of it in one sitting. Good luck! * On a final note, it has come to my attention that I require a new food processor. Mine was a hand-me-down from my grandmother and, while it has lived a fine life, it’s now older than I am and not quite up to snuff. Any recommendations from the peanut gallery on a new appliance that won’t put me in the poor house would be greatly appreciated.